Toluene and trichlorethylene are organic solvents which are widely used in industrial settings .Occupational exposure of these solvents may induce hepatic injury. In this study we determined the hepatic enzymes alanine transaminase (ALT) and aspartate transaminase (AST) of the workers who are occupationally exposed to toluene (n=152), trichloroethylene (n=125) , or both (n=77); group 1, group 2 and group 3 respectively. Comparison with a control group (n=158) whom are not occupationally exposed to any organic solvent was done. Regarding AST and ALT we observed a significant increase in solvent exposed (toluen, triccloroethylene(TCE) , toluen and TCE) groups when compared to non-exposed control group (p < 0.001). The median values of AST and ALT for solvent exposed groups did not exceed reference range. ALT levels were above reference levels in 5.3% of group 1, 7.2% of group 2 and 5.2% of group 3 . Also AST levels were above reference levels in 5.9% of Group 1, 4% of Group 2 and 3,9 % of Group 3. In all of the exposed groups, the percentage of above the reference level of both enzymes, were significantly higher than the control group. None of the controls had above the threshold enzyme levels. Exposed groups all had a ratio of ALT to AST (ALT/AST) higher than 1; 1.14, 1.2, 1.09 for group 1, group 2, and group 3 respectively. According to our results toluene and TCE does not cause acute hepatotoxicity but some elevation of ALT and AST is present. ALT and AST of occupationally solvent exposed workers should be routinely monitored and necessary precautions should be taken. Brautbar, Nachman, and John Williams II. "Industrial solvents and liver toxicity: risk assessment, risk factors and mechanisms." International journal of hygiene and environmental health 205.6 (2002): 479-491. Giannini, Edoardo G., Roberto Testa, and Vincenzo Savarino. "Liver enzyme alteration: a guide for clinicians." Canadian medical association journal 172.3 (2005): 367-379. Hyeon, Chang Kim, et al. "Normal serum aminotransferase concentration and risk of mortality from liver diseases: prospective cohort study." Bmj 328.7446 (2004): 983. Toxicological profile for toluene U.S. Department of Health and Human services public health service agency for toxic substances and disease registry September 2000. Bond GR. Hepatitis, rash and eosinophilia following trichloroethylene exposure: a case report and speculation on mechanistic similarity to halothane induced hepatitis. J Toxicol ClinToxicol.1996;34(4):461-6.Review. PubMed PMID:8699563. Malaguarnera, Giulia, et al. "Toxic hepatitis in occupational exposure to solvents." World journal of gastroenterology: WJG 22 (2012): 2756. El Hady, Hala Mostafa, et al. "Serum bile acid as a screening tool in workers occupationally exposed to mixtures of organic solvents." Toxicology and industrial health Oct 5;30(7) (2012):645-652..
ISNAD Bal, Ceylan , Büyükşekerci, Murat , Ağış, Erol Rauf , Ercan, Mujgan , Gündüzöz, Meşide , Köş, Mehmet , Hocaoğlu, Asım , Yılmaz, Ömer Hınç . "Effects of Occupational Toluene and Trichloroethylene Exposure on Liver Enzymes". 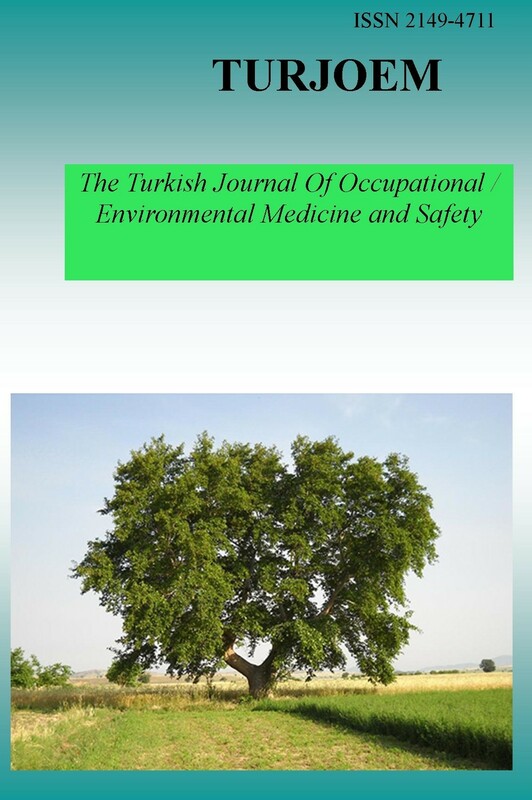 The Turkish Journal Of Occupational / Environmental Medicine and Safety 1 / 1 (May 2015): 1-10.